You got that from up didn’t you? I have to say, so far I love this! I hope to see many more pages in the Future. From up? Not sure what you mean, but I’m glad you’re enjoying the comic! 😀 Thank you so much! Loki has the best pets. Also I got an almost just as awesome purple tunic like Coal’s and now it makes me sooo happy whenever this updates! Wow, really? Awesome! He actually ends up changing clothes later on but that’s not for a long time. XD Thank you! I’m going to put together a coal outfit over Christmas break, because I’m such a fanboy. And when you change outfits I’ll probably get that one too ~_^. So loving this, keep up the awesome work! Like the story so far, but will Coal ever get time to repair his tunic or at least get a new one? Thanks! And yes, he will. XD He actually gets a change of clothes in a couple of chapters too. One last question Sarah (I may have missed it while I was avidly reading your comic), what does the meaning of the title of your comic? They seem to be very familiar words that can be easily translated into English, but I would like your educated answer regarding this matter. Thanks in advance. P.S. I like what you did with Loki’s character. He seems very down to earth and human. Thank you very much for the explanation and I look forward to returning to your site every Thor’s day. Man, I want an enchanted Viking ship for a pet now. I looked at Loki’s face today and interpreted him to have DOUBLE bags under his eyes. Haha, maybe he does! I’ll be honest that I don’t actually know what they are, aside from designy lines. Bags are good. He’s been through a lot! I’m assuming Rollo is a boy, does he just love hugs? 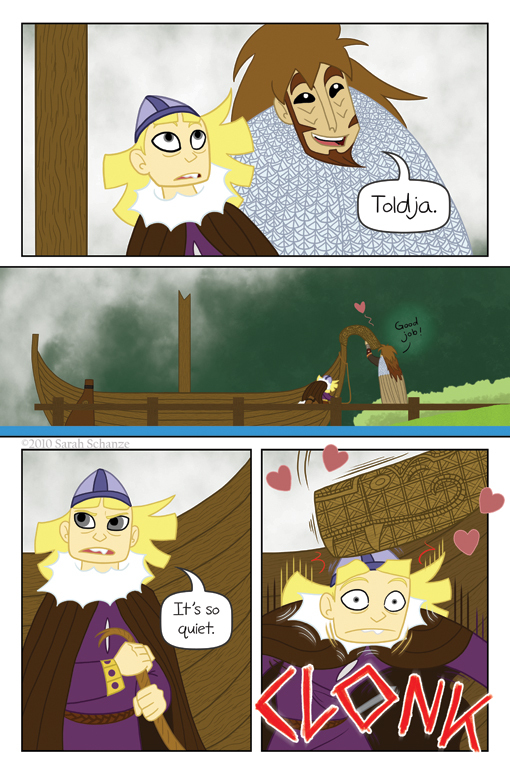 Sweet Rollo in the last panel reminds me of Kevin. Haha! They are both pretty affectionate.